Despite of the rapid development of the Internet during the last years the television remains one of the basic sources of the information, entertainment and rest for many people. The television is the source of earnings and means of customer’s attraction for cable operators, Internet providers (IPTV), hotels, sports clubs, restaurants and TV channels. 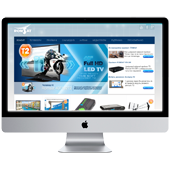 Our company has more than 15 years of television systems building practical experience with different levels of complexity. Digital Terrestrial Receiver, CAM modules, antennas, media players, etc .